It was a rainy day at the Lake Apopka Wildlife Drive. It wasn’t the ideal morning to be out with a camera, but the birds were still happy to see me. One of my first birds turned out to be three birds. 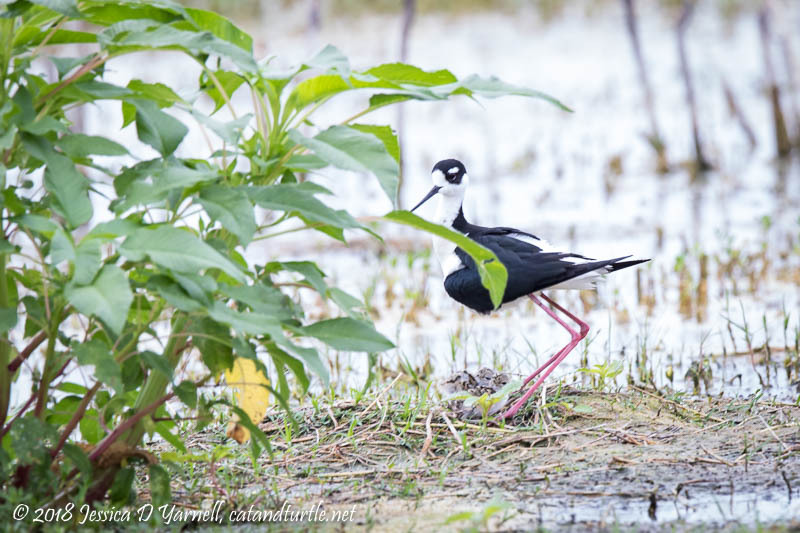 When I saw a Black-necked Stilt lying down, I wondered if she was brooding some babies. She didn’t make me wait long to find out. She stood up quickly and plop! two fuzzy powderpuffs were left uncovered, wondering where their umbrella had gone! My next bird was a surprise. 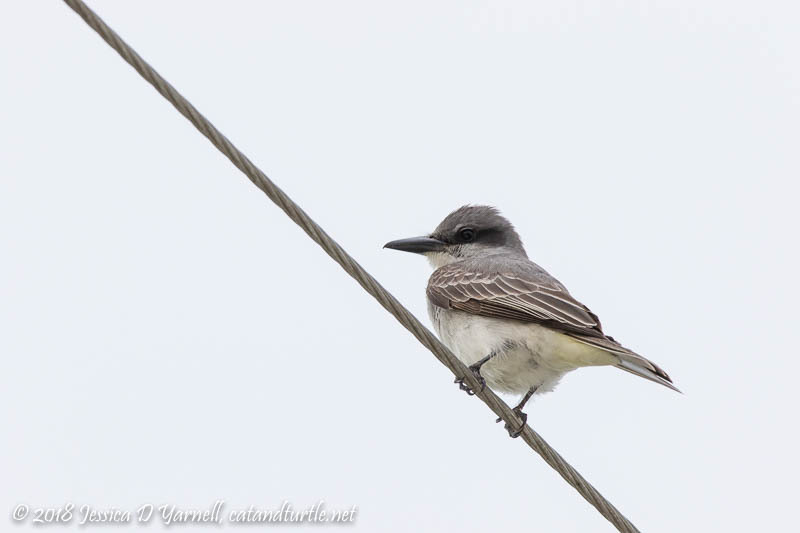 I noticed a kingbird on the power wires, and in the bad light, I assumed it was an Eastern Kingbird. They have been migrating through the area recently. When I got home and saw the bird closer, I had to pull out my bird identification books. Turns out I had seen a Gray Kingbird. I confirmed on eBird that one has been sighted at the wildlife drive recently. Lifers are especially fun when they are unexpected! 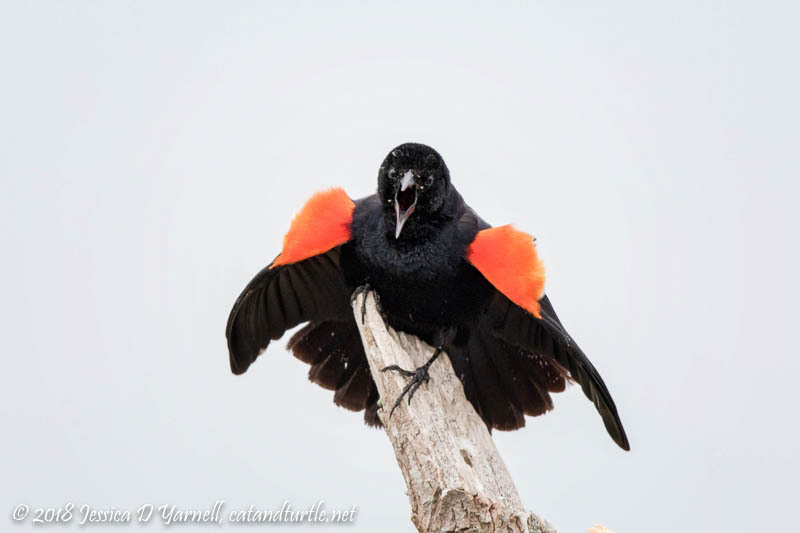 The Red-winged Blackbirds were in full voice that morning. The males sit high above their nesting territory, singing and defending their growing families. This one did so while showing off every inch of his red and orange stripes. Juvenile wading birds are showing up all over the drive. You can both hear and see the frustrated juvies flapping their wings and begging for food. The problem is, some of them are old enough to start feeding themselves! 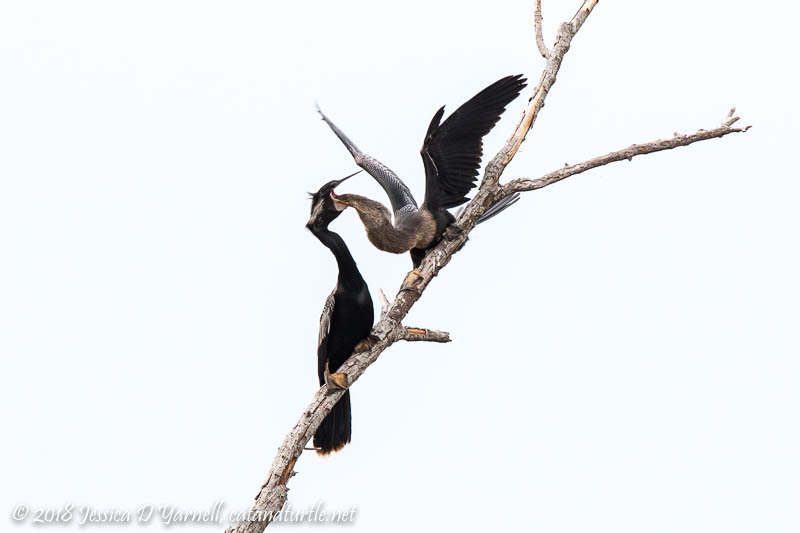 This juvenile Anhinga stuck his head waaaay down his mom’s throat in order to eat some regurgitated food. One of my favorite subjects at the wildlife drive is ready to put on their best show. Meet this year’s juvenile Barn Swallows, who hang out on tree branches and wait for Mom and Dad to fly by with food. The babies are so cute as they dance for their dinner. Look at those gaping mouths! 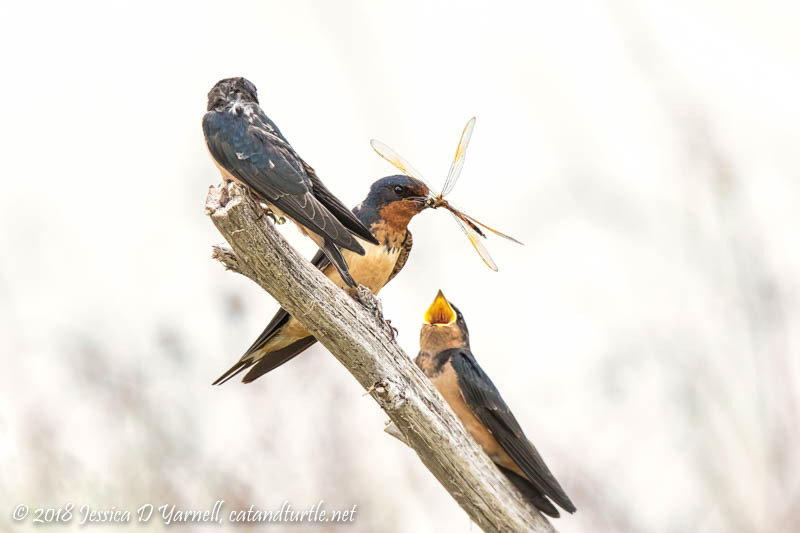 This Barn Swallow mom flew in with a nice dragonfly. The problem is, she had two babies who both wanted to eat it. How to choose? Eeny, Meeny, Miny, Moe. Into which mouth shall it go? Stilt babies, wow! Very nice day considering the weather. Tough shooting conditions but you sure made some lovely photographs. 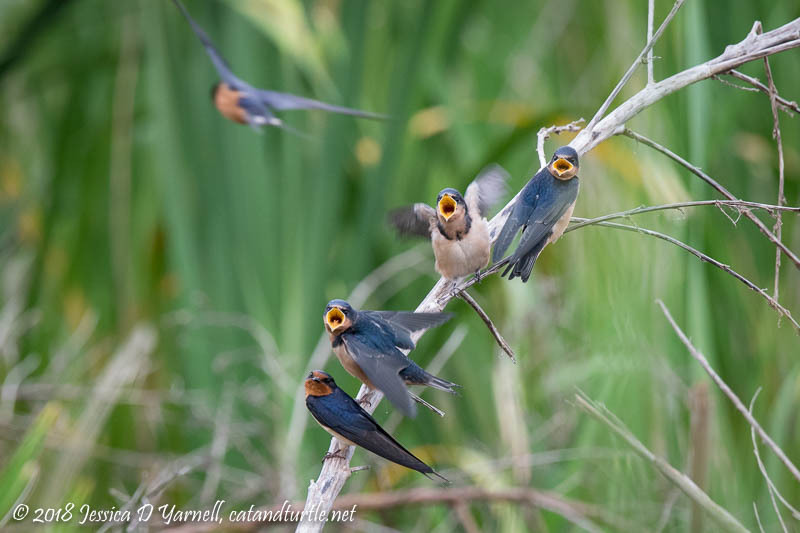 Love the swallow show, that’s fantastic! Those swallow shots are amazing. I never see them sitting still.